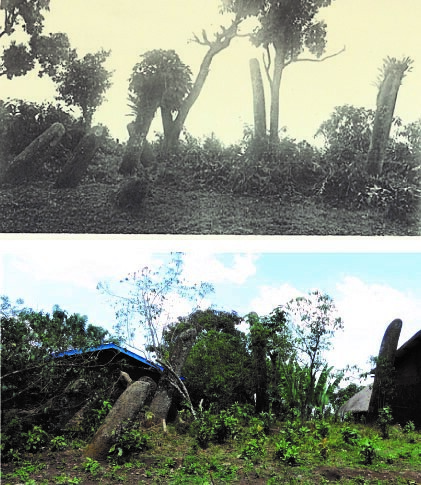 Pioneer work conducted by François Azais in the 1920s gave the scientific community first insights into the megalithic sites of southern Ethiopia but excavations on some of these sites only occurred very recently with work conducted by Roger Joussaume and his collaborators at Tuto-Fela and Chelba-Tutitti (1993-2010) after decades of research on megalithism in other parts of Ethiopia (e.g. Tchercher, Tiya). These excavations were later supplemented by systematic surveys and inventories conducted by Abebe Mengistu and Habtamu Tesfaye (ARCCH), and more recently by Anne-Lise Goujon who developed a comprehensive database of sites in the Gedeo zone (see our previous post here: cfee.hypotheses.org/1060). Archaeological investigations were also conducted in the region by a team from the Washington State University in 2015-2016 but this came to our knowledge only recently. The Abaya archaeological mission conducted in January-March 2018 allowed for the first time the systematic investigation of the region of Gedeo by an interdisciplinary team of over 20 specialists. Our team conducted both large-scale archaeological and geomorphological surveys, 3D recording of monuments using photogrammetry and a total station, geophysical survey of several monuments using electric resistivity, technological and typological characterization of stelae, test excavation of several areas at Doko Chore and Chelba-Tutitti, and extensive excavations at Soditi 2 and Sede Mercato. In addition, an investigation of modern ceramic traditions among Oromo Guji communities of the area was conducted by a team led by Jessie Cauliez (CNRS, TRACES) within the framework of her ethnoarchaeological project (see our previous post here: cfee.hypotheses.org/1837). 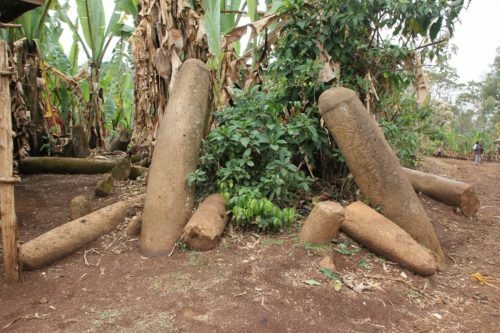 Our survey conducted in 2018 has permitted the discovery of 3 sites with phallic stelae within the area studied (Fig. 1): Quto and Quloa, which are located along the crest between Soditi to Doko Chore (Fig. 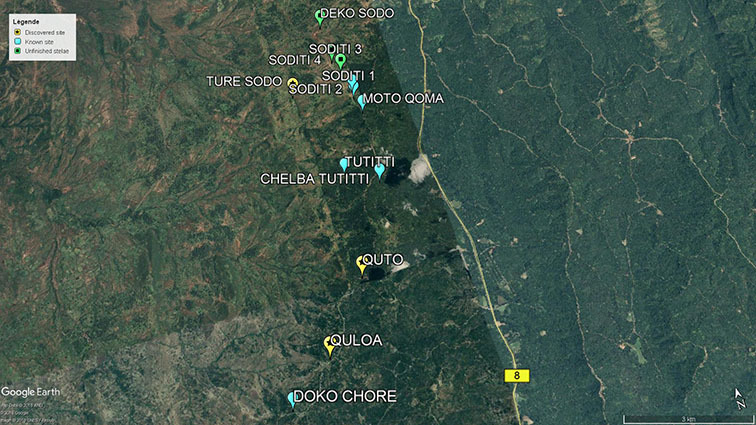 2 and 3) and the site of Ture Sodo, facing Soditi, were we have recorded thirty megaliths. In the 1920s, François Azaïs camped in Buqqisa where he described quantity of stelae all along the crest and took photographs of some of them. Nowadays the village of Buqqisa is a large settlement and the site was referred to us as Doko Chore. Since François Azaïs first observations, many stelae have fallen down. We mapped the stelae and conducted observations on the tumulus-like feature visible on the left of the pictures, cleaning a section that resulted from a recent house construction. We then conducted micro-stratigraphic observations supplemented by sampling of sediments. In addition, a geophysical survey was conducted on an area of 180 square meters. (top: photo. after Azaïs F., 1931: pl. LXXIX; bottom: photo. A.-L. Goujon). The site of Chelba-Tutitti first surveyed by Francis Anfray in the 1970s was test excavated by Roger Joussaume and Jean-Paul Cros in 2009-2010, additional test excavations were conducted by the same during the 2018 campaign. 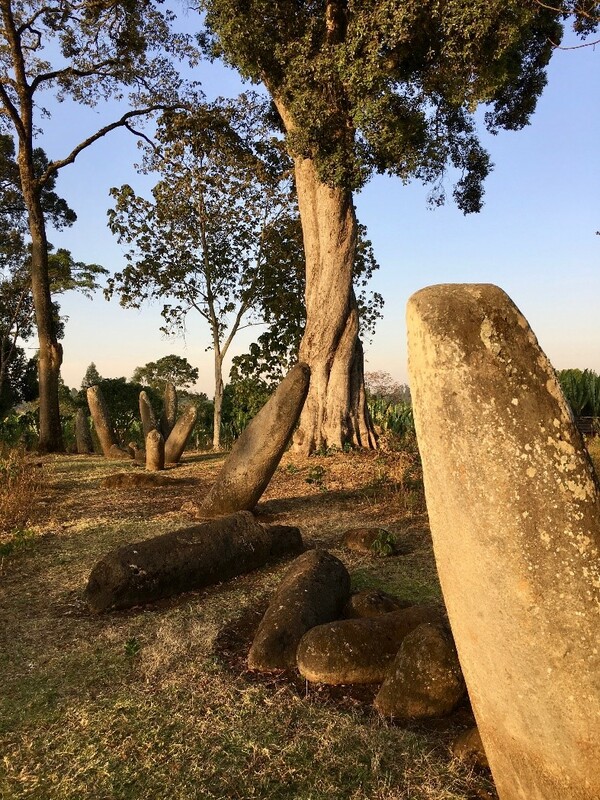 Initial inventory estimated the number of stelae between 700 and 1700, which makes it particularly famous and interesting, being by far the largest known megalithic site in Ethiopia. During the 2018 season a systematic mapping of Chelba-Tutitti was undertook, we cleared the vegetation and took aerial photographs with a drone in order to produce a global orthophotographic coverage of the site. This was supplemented by an inventory on the ground of (mentally) conjoining fragments and disturbed areas. This will eventually allow for a better estimate of the number of steale on the site. In addition, geophysical survey was conducted on 6 different sites. Results permitted to help identify areas more suitable for excavation and to propose two main working hypothesis on sites typology, chronology and funerary structures associated. First, on anthropomorphic stelae sites, initial graves may have occupied a larger area than the cairn surface itself. Second, phallic stelae alignment could be associated with cairn, as in Soditi 2, but not visible on surface; like possibly on one of the most impressive site: Sakaro Sodo (fig. 4). Figure 4: Sakaro Sodo, southern part of the research area. More than 40 stelae including fragments are scattered along a curved line with 8 massive ones still standing (photo. A. Tixier). Regarding typology, important attention has been paid to the topographic position of sites. Geomorphological observations have shown that sites with stelae correspond to similar patterns. These topographic recurrences highlight the importance of focusing on site location and their geographic attributes in order to better understand settlement patterns, “domestication” of the landscape, and territory demarcation. This occupation of the landscape is still vivid and sites with stelae are most of the time situated along the main modern pathways and roads. The site of Sede Mercato corresponds to a concentration of 470 stelae erected within cairns forming a flat platform of stones installed on a sloppy surface of ~1000 m2. It belongs to the so-called “anthropomorphic type”, as described at Tuto Fela, which is characterized by human face representation and specific geometrical decoration, and by the use of a carving tool that let larger traces than those observed on phallic stelae. Similar characteristics are found in Sede Mercato but geometrical decoration are rare and face representation almost absent. An Excavation was conducted by Roger Joussaume and Jean-Paul Cros on an area covering ~15 m2 on the eastern side of the site. It allowed them identifying similar blocking structures than in Tuto Fela. Two burials have been discovered, both of them associated to one of the 5 stelae groups. State of preservation of human did not permit detailed anthropological observations, but could be dated to the 15th century AD. The peripheral position of this sepulture has to be taken into account for interpretation of this late age. A major excavation was conducted at the site of Soditi 2, ~2.5 km north of Chelba-Tutitti. 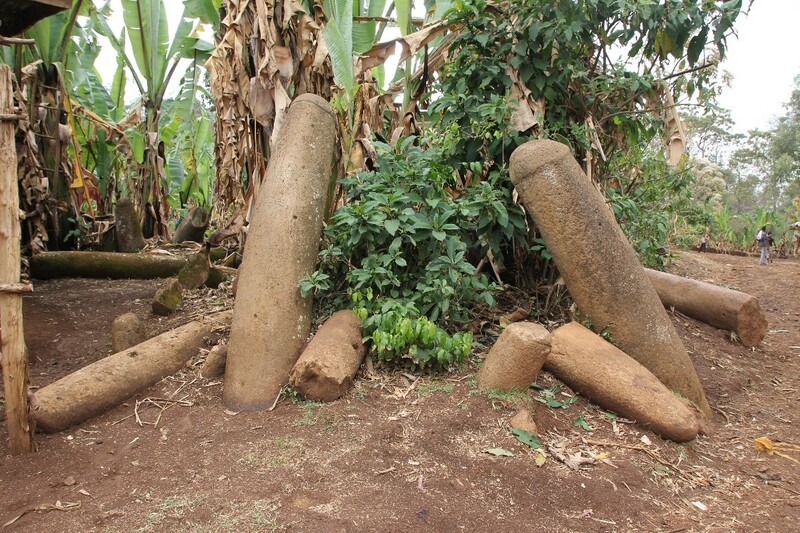 Known for its single phallic stele erected at the top of a promontory, the discovery of 4 possible cairns during our survey motivated an extensive archaeological operation there. Manual cleaning of all the structures was accompanied by a geophysical survey to get a first idea of the presence of ​​buried structures. The meticulous excavation of Cairn 1 proved to be quite exceptional with the identification of a new kind of funeral monument for this region. Under the cairn, consisting of large blocks of rhyolite and fragments of phallic stelae, a large pit was discovered. In its filling, 8 tombs have been identified, 6 were excavated. One of them is similar to the « sock-shape tombs » unearthed on the nearby site of Tuto Fela with a comparable dating around the 12th century AD. Another grave is dated to the 13th century AD which attests to the use of this funerary structure during a long period of time. Sedimentary samples were taken to understand the conditions of installation and frequentation of the monument. 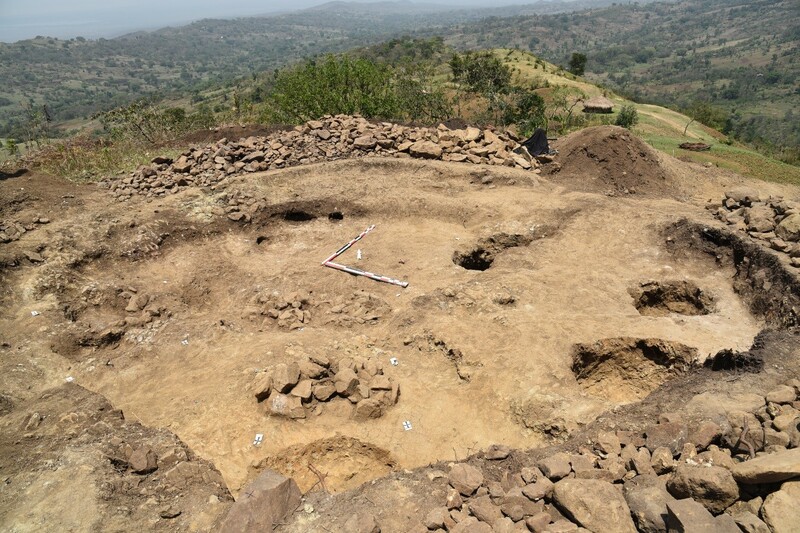 Smaller test excavations may indicate that the two easternmost cairns are the remains of a stone platform erected at the top of the promontory after dismantling at least one or two lines of stelae. The remaining blocking structure of these stelae were excavated. Analysis of field data and of the numerous remains (ceramic, obsidian and human bones) is under study. Given the exceptional nature of this site, further excavations would be of great interest. Figure 6: Soditi 2 at the end of the 2018 excavation. Under Cairn 1, 8 tombs have been dug in the backfill of a large pit (photo. V. Ard). The 2018 field season was recorded by a TV crew led by Alain Tixier. A 90-minute documentary should be produced later this year and broadcasted on the French-German TV channel Arte (MC4 Production). 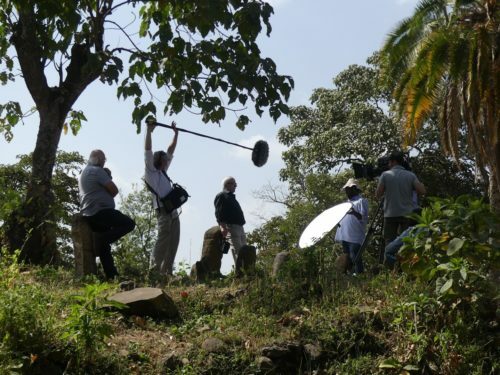 Figure 7: Alain Tixier and his crew filming Roger Joussaume (photo. A.-L. Goujon). 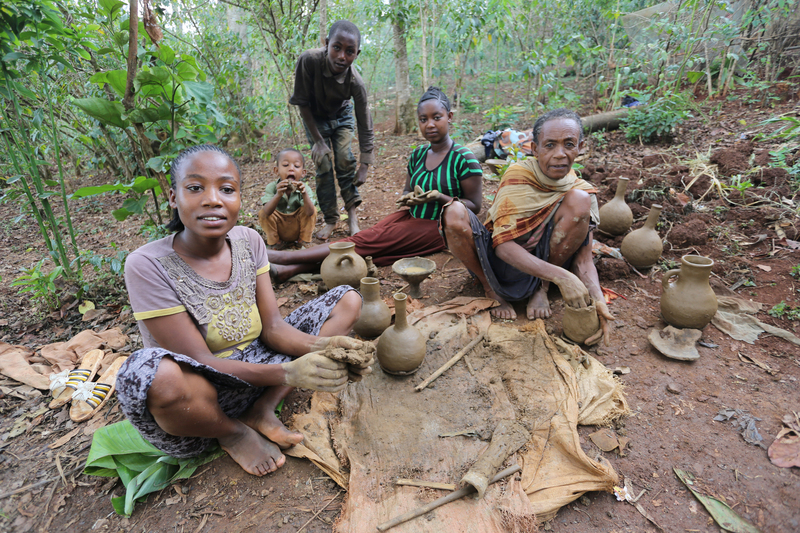 Figure 8:  Turunesh, Zemanesh and Ababesh, potters from Yerga Cheffe (photo. J. Cauliez). 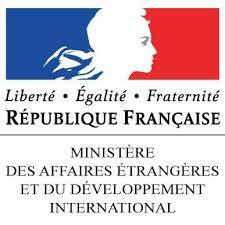 Vincent Ard (CNRS, TRACES), Anne-Lise Goujon, (Université Paris 10, PréTech), Roger Joussaume, (CNRS, emeritus), Sophie Corson, (Départment de Vendée), Jean-Paul Cros (ArScAn), Marie Matu, (Université de Bordeaux, PACEA), Clément Ménard, (Cfee), Vivien Mathé (Université de La Rochelle, LIENSs), Marylise Onfray (Trajectoires), Antoine Laurent (TRACES), Laurent Bruxelles (Inrap, IFAS), Régis Bernard (Inrap), Philippe Gouézin, (CReAAH), Jessie Cauliez (CNRS, TRACES), Claire Manen, (CNRS, TRACES), Michel Riffé, Alebachew Belay (Université de Toulouse, TRACES), Sintayehu Gobezie (Arba Minch University), Abiyot Tura (Dila University), Metasebia Bekele (ARCC), Melkamu Teffere (Dila University), Abebe Hailu (ARCCH), Mulune Tefera (SNNPR culture bureau), Tsegay Tadesse (Gedeo Zone culture bureau), Salih Mamma (Oromia culture bureau). We are grateful for the warm welcome of local communities, only the help of several dozens of local workers made it possible to clean and excavate the different sites in such a short period of time.